If our email does not show up on your phone switch from mobile to desktop site. "Octavia" Daughter of "Young Supercrack" & "Triple Threat". Family of 1st place winners & Ace pigeons! Super Breeding Hen & Producer of Super Breeders, One of the Best Ludo Claessens Hens Ever in America. Daughter of Ludo Claessens Famous "Katoog" when he was mated to a full sister to "Double Gold". Double Gold is dam to Red Venus said to be the Best all-around hen in the World 100 - 600 miles. Granddaughter of two of Ludo's very Best Breeders "Dik Licht 56" & "Late Rode 430". Aljona will be mated to "Days of Thunder" & "Dark Horse Jr". "Days of Thunder" is a super racer & breeder for us, he won 2nd Ace Young Bird & 2x 1st 5min & 10min lead. He is sire, grandsire, & great grandsire to many winners & Ace pigeons. His son "Young Supercrack won 2nd Ace Middle Distance & 2nd Champion Bird Concourse '14 & bred "Octavia" 3x 1st & 3rd Ace Middle Distance two years in a row. He is grandsire to "Midwest Nikki" 1st 442mi Topeka Midwest Classic vs 3,619 birds 2min lead & grandsire to "Ricky Bobby" 1st 350mi Fall Classic OLR '17. His descendants perform best 250 - 350mi Young birds and out to 600mi as old birds 1100 -1900 YPM. "Dark Horse Jr" is our super breeding son of "Dark horse" & 1/2 brother to "Horse Reliable" 2nd Grand Avg. & 4th Final SAMDR. "Dark Horse Jr" is sire to "Midwest Nikki" 1st 442mi Topeka Midwest Natl. Classic vs 3,619 birds '16 2min lead. Kyle Drovie on breeding 2nd Champion Bird Lakeland Flyers Pigeon Club '18, Flown by Kenny Peer. 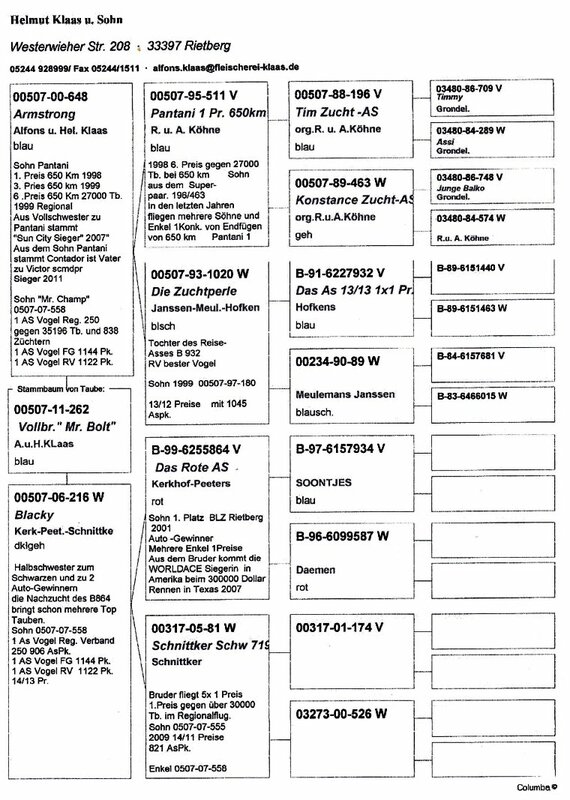 Sire is a direct son of Grizzly & Golden Witte 59 & dam is a direct daughter of Mr Bliksem & Vedette Jr.
Watkins Loft wins 5th, 32nd, 42nd 350mi vs 199 birds Red Band Race '18, eq 1st 8th Baltimore Black Eye Susan Race '18, & multiple top 10% Boston Concourse '18 - Dam is "300" daughter of "Mr Bliksem" & "Miss Kodiak", also down from Jonge Supercracks Inbred, Grizzly, Miss Katoog, Supercrack 63..
Dan Romanski wins 49th Final Hoosier Classic Million Dollar Race '18 - Dam is down from Jonge Supercrack's Inbred & Miss Supercrack. Gary Young on winning 69th Grand Avg. & 244th Final SAMDR vs 4,247b '18 with "Mealy Deal" the best Grizzle to race in SAMDR '18. Down from Grizzly & Miss Katoog. We got a report a few weeks ago that our Ludo Claessens down from Grizzly, Miss Katoog, & our Jonge Supercrack blood are performing in Taiwan. Nhia Thao 777 on winning 2nd National Ace Young Bird all Minnesota '17. The sire to Nhia's winning bird is out of Brother Mr Bolt & Blue Bolt - Alfons Klaas. Dan Romanski on winning 1st Overall Ace Young Bird Digest Awards & 1st Sprint Ace 2016. Dan's bird is down from Jonge Supercrack's Inbred & Miss Supercrack, Ludo Claessens. John Musham on winning 1st 530mi vs 220 birds ESM '17. John's bird also placed 8th Motor City and was a bird we sent in for the Detroit Motor City Race for Richard Erickson. - 100% Ludo Claessens down from Grizzly, Miss Katoog, Kodiak, Jonge Supercrack's Inbred, Mr Bliksem, & Vedette Jr.
Fue Yang on breeding 2nd 200mi vs 135 birds '17 flown by Eng Loft. The sire of Fue's bird is inbred to our Ludo Claessens Grizzly, Tom Cat, Golden Witte 59, & Miss Katoog. Bred from a direct son of "Mr Bliksem" & "Vedette Jr" when mated to a direct daughter of "Day's of Thunder" & "Mission Impossible". Out of two different daughters of "Jonge Supercrack's Inbred" when he was mated to "Miss Supercrack" & "Katrina". Bred down from a son of "Brother Mr Bolt" & "Blue Bolt". Fall Classic Final '17 & '18 winners. Both down from our Ludo Claessens, John Stoll, & Alfons Klaas. Daughter of "Young Favorite" & "Little Miss Birdy". "Little Miss Birdy" is a daughter of "Brother Mr Bolt" & "Sister Mark". Both 618 & 699s sires brother bred the 1st Grand Avg Ace Victoria Falls OLR '18. Two Inbred grandchildren of the Worlds best South African Million Dollar Racer Ever "Birdy". The Birdy bloodlines have simply dominated the SAMDR, local racing & one loft racing around the World. This blood crossed to the Mr Bolt & Brother Mr Bolt blood & then crossed to our own Ludo Stoll blood has had a huge impact in our own lofts in 2016 we won 1st 442mi Topeka Midwest National Classic vs 3,619 birds & 296 lofts with a 2min lead in America's Largest old bird race. 10th 552km vs 2,866b nine-hour race with soaring temperatures of 35°C (94.28°F). Our Ludo Claessens, John Stoll, & Alfons Klaas bloodlines have produced more Ace Young Birds consistently than any other bloodlines in Minnesota. All of our key breeders have bred winners or breeders of winners with multiple mates of different bloodlines. Descendants of Miss Katoog have won 13- 1st Ace Pigeon titles. We have built our own family of Ace pigeons that consistently produce Ace pigeons year after year. Which are a combination of select birds from Ludo Claessens, John Stoll, & Alfons Klaas bloodlines. Two of the best pigeons to race in the Midwest in 2016 both going back to our Top Ludo Claessens breeders "Grizzly", "Tom Cat", & Our Best Ever Breeding Hen "Miss Katoog". Inbred to our Foundation breeders Grizzy, Tom Cat, & Miss Katoog. Direct son of "Red Vedette" & "Lucky Girl". "Red Vedette" is bred from a inbred son of "Grizzly" & "Vedette Jr". "Lucky Girl" is the last daughter of "Grizzly" & "Young Miss Katoog. Our Ludo Claessens are breeding winners, National Ace pigeons, & AU Champion all over the USA. We are currently breeding from 6- 1st Ace pigeons, several 2nd, 3rd, & 4th Aces plus multiple 1st place winners. One thing almost almost all these birds have in common is they go back to our Super breeding Ludo Claessens "Grizzly", "Tom Cat", & "Miss Katoog". Grandson of "Mr Bliksem", "Vedette Jr", "Brother Simply The Best", & "Miss Tours". Granddaughter of "Grizzly", "Miss Katoog", "Mr Bliksem", & "Vedette Jr". Inbred Grizzly, Tom Cat, & Miss Katoog. Grandson of "Grizzly", "Vedette Jr", "Red Ludo 88", & "Young Miss Katoog". 1st Overall 442mi Topeka Midwest Natl. Classic vs 3,619b '16. America's Largest Old Bird Race. Granddaughter of "Days of Thunder", "Miss Bolt", "Dark Horse", & "Naomi". Son of "Grizzly King" & "Beautiful Pozzato Girl". Grandson of "Grizzly", "Miss Katoog", "Pozzato", & "Zata". Daughter of "Brother Mr Bolt" & "Blue Bolt". Son of "Brock" & "Young Miss Katoog". Grandson of "Thunder", "Maria", "Tom Cat", & "Miss Katoog". Son of "De Favorite" & "Golden Witte 59". Grandson of "Thunder", "Sophia", "Tom Cat", & "Miss Katoog". Daughter of "Little Bear" & "Bont Vedette". Granddaughter of "Grizzly King", "Beautiful Pozzato Girl", "Sister Super Vedette", & "Kenny". Little Bear won 1st Ace Young Bird Twin City Concourse '13. Bont Vedette is inbred to "Jonge Supercrack" Ludo Claessens #1 Breeder.